Clean contemporary lines combined with generous seating make the Aspen sectional a destination for comfort. Sink back, relax and recline with deep cushioning. Choose from a variety of custom fabrics including leather-like Renew and Breathable Urethane with single-needle topstitched detailing. 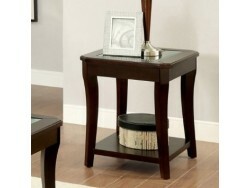 The Bancroft end table features a framed top with beveled edge glass insert above an ornamental arch metal motif. 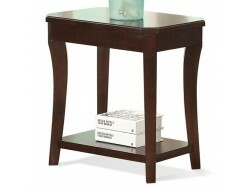 Constructed of poplar hardwood solid and birch veneer with a dark mahogany finish. 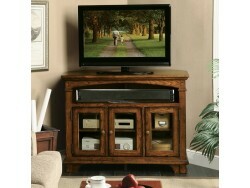 The Marston Corner TV Console features three doors with beveled glass inserts that enclose an adjustable shelf. The console has two top open storage areas and interior wiring access and ventilation cutouts for your home entertainment electronics. Constructed of poplar hardwood solid and cherry veneer with a rutledge burnished oak finish. 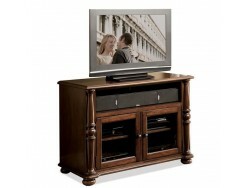 The Dunmore 42" TV Console features two doors with beveled glass inserts, each containing an adjustable shelf. The console has two top open storage areas and interior wiring access and ventilation cutouts for your home entertainment electronics. Constructed of poplar hardwood solid and cherry veneer with an upland cherry finish. Are days in your life leaving you tired and drained of energy, motivation and creativity? The re-fueler to the rescue! Generously scaled back and sumptuous cradling cushioning make the Re-Fueler the place to kick your shoes off and refresh, revive, refuel and restore. The Bancroft chair side table features a soid top with shelf for display or storage. Constructed of poplar hardwood solid and birch veneer with a dark mahogany finish. 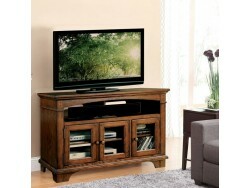 The Marston 42" TV Console features three doors with beveled glass inserts that enclose an adjustable shelf. The console has two top open storage areas and interior wiring access and ventilation cutouts for your home entertainment electronics. 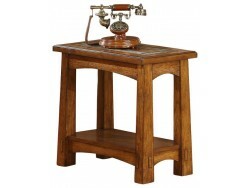 Constructed of poplar hardwood solid and cherry veneer with a rutledge burnished oak finish. 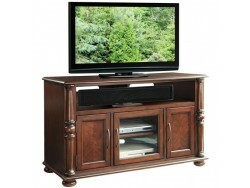 The Dunmore 50" TV Console features two doors with beveled glass inserts, each containing an adjustable shelf. The console has two top open storage areas and interior wiring access and ventilation cutouts for your home entertainment electronics. Constructed of poplar hardwood solid and cherry veneer with an upland cherry finish. The Brandon leather recliner features a unique curved pillow top arm, a deep, reclining bucket seat that cradles your body in comfort, and beautiful styling that is sure to enhance the beauty of any room. The Comfortscapes recliner is generously proportioned resulting in ample seating space, tailored pad over arm pillow, padded reclining chaise topper, press-back stationary chaise, and the tailored picture frame back are just a few of the features making this recliner a natural selection when demanding every-day- lived-in reclining comfort. The Home Craftsman chair side table features a framed top with a slate tile border and a veneer panel insert and fixed bottom shelf. The table is constructed of hardwood solid and oak veneer with an Americana Oak finish. 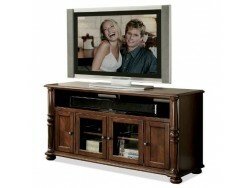 The Dunmore 60" TV Console features two doors with beveled glass inserts, each containing an adjustable shelf. The console has two top open storage areas and interior wiring access and ventilation cutouts for your home entertainment electronics. Constructed of poplar hardwood solid and cherry veneer with an upland cherry finish. 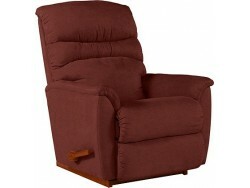 The Brandon recliner features stylish pillow topped curved arms, deep, comfortable bucket reclining seats that cradle your body, and a pub styled back. The Brandon will enhance the beauty of any room. Available in a variety of leather colors.